So you’re considering buying an air purifier. But perhaps you want to breathe better, cleaner air in more than just 1 room. In this post I’ll go into more detail and cover the facts you need to know before spending any money. I’d like you to get the most benefit from your buying options and to get the best benefit per dollar spent. 5. Where should I place my air purifier? 7. In summary: Do I need an air purifier in every room? Where should I place my air purifiers? How do I position them? Are there any special kinds I need to buy? I’ll cover all of these in detail below. Ultimately, the basic, straight answer is that you do not need an air purifier in every room. However, you need to buy the right kind (or combination of different kinds) for your needs. Additionally, you need to buy models with sufficient coverage for your particular home & needs. You’ll also need enough of them to handle the air space where you have air quality problems. If you want the air inside your house to fresh and free of irritants, it only makes sense to place air purifiers in all rooms… right? To be frank, placing an air purifier in every room would be pricey. From the very beginning you really need to think about your expectations and air cleaning needs vs. the amount of money you can afford to spend. While this may vary from home to home, the average house has about five rooms. How much are you able to spend to provide purifier coverage for your entire house? Give this some thought before you go shopping online. Some people might be inclined to purchase cheap ones so that they can place air purifiers all the rooms. This is actually a mistake that might not seem obvious at first glance. Cheap, low-spec air purifiers can actually be worse than having no air purifiers at all. There are lots of reasons why, but it is mainly because they do a poor job at cleaning the air and ultimately you’ll be unhappy with the results. In some cases some products sold as “air purifiers” do little besides blow air and some produce by-products that can irritate the throat and respiratory system. If you have to spend additional money later to buy better ones, that means you’re actually losing money – not saving it! Cheap ones will only circulate dirty, unfiltered air through your house to the point that you would probably be better off without one. A single air purifier of good quality is worth more than several low-grade ones that work poorly. Remember this: Quality over quantity. Every time. That being said, for a decent budget air purifier you can expect to spend about $50-$100 for each one. Higher quality models that are best sellers and have amazing buyer satisfaction are only a little bit more, at $80-$200 depending on room size capability and features. More advanced models provide a lot more convenience and can even operate in automatic mode or include a remote control. Don’t worry! You don’t have to be rich or spend a ton of money to keep the air clean in your home. There are some great options that are affordable – you just have to be careful when buying. I’ll cover that more in detail below. Not everyone has the same air quality needs. For example, if you have pets you’ll have slightly different requirements than someone who is dealing with dust. And the person with allergies or asthma problems, for example, will need different features as well. Pet owners can get great relief from pet hair, dander, and smells with a great model like this one as an example, although you need not spend that much if desired. A wide variety of contaminants – or combinations of those – require a “real” air purifier that will permanently remove them from your air. Some, like dust mites require a HEPA filter. Odors and airborne chemical substances need a carbon filter to cleanse the air successfully. Think about what you specifically need relief from. I’ve written a great post called “What Kind Of Air Purifier Do I Need?” here which goes more into detail. Ultimately, it if involves removing odors, you need one that features an activated carbon filter. For general applications, at minimum you need a High Efficiency Particulate Air filter (HEPA) model with sufficient room coverage. If you have particular health issues or are susceptible to colds or other sicknesses, you might consider a model with a germ-killing feature. Some accomplish this with an ionizer or ozone generator. I don’t recommend the these for people with respiratory problems, although ionizers are proven to greatly reduce airborne gems that cause sickness. Here's an example of one which has an ultraviolet light (UV) germ-killing feature. This type is safe and can help reduce the chances of you contracting illnesses. Others offer advanced convenience features like self-off timers, a quiet mode, and so on. One even includes Wi-Fi connectivity for smart phone control and air quality reports while you’re away! Do you spend a considerable amount of time inside your house? Which rooms do you stay in the longest? Which rooms do you seldom use? An average person spends the longest time in their bedrooms, followed by the living room. Most likely the time you spend in other rooms would pale in comparison. Air purifiers placed in rarely used rooms are useless so they would be a poor use of your money. What’s the use of purifying the air in an area you don’t use? Don’t be concerned about rooms that are rarely entered. Much as you seldom enter them, so the same is true for air contaminants. Unless some of the areas of your home have exposure to the outdoors (and particles brought inside) or other sources of poor air quality, it really shouldn’t be much of a concern. Concentrate mainly on adding air purifiers to the main areas – and areas in between – that you spend the most time in. The areas where you, your pets, or others predominantly reside are the rooms that need air purifier coverage. Placing them in between means that other areas will have their air cleaned as well. Although they’re rated for certain size rooms, air purifiers will still circulate air from other parts of your home. It does take some time, but additional rooms will have their air purified as well if air can circulate sufficiently. Most air purifiers sold specify the recommended room size they can clean in terms of the size of the room. This is usually stated in square feet (sq. feet, or “ft^2”). Others may optionally state the room air coverage in cubic feet, which is very similar to room size except that it also takes into account the ceiling height of a room. Unfortunately some may not specify this coverage ability clearly. If a purifier doesn’t specify room size, assume it is generally good for a small room. Before shopping you need to estimate these rough numbers using some easy math. Don’t worry, as even if math isn’t your strong point, it’s not hard at all. 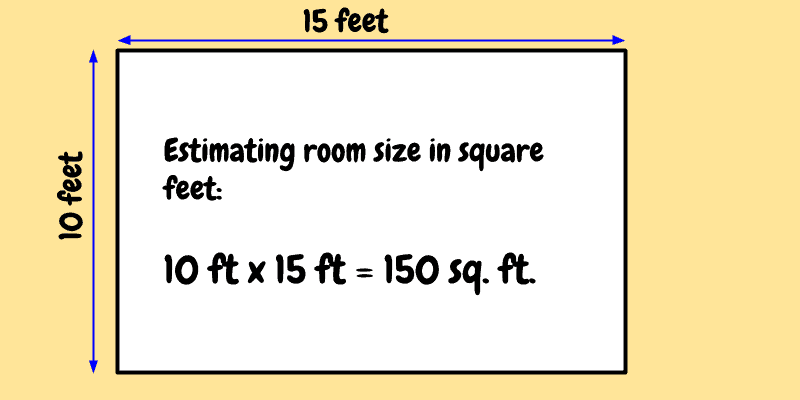 Room width x room length x ceiling height = 10 ft x 15 feet x 15 feet = 2,250 cubic feet (ft^3). After estimating the room size coverage you need, write it down in your notes. That way you’ll be ready before shopping when evaluating choices and you can verify it’s close to your room size. The room size listed by different manufacturers are estimates. Just like any other kind of estimate, it’s impossible to get the exact number – but the great news is that you don’t need to. The idea is to buy an air purifier based on the room size coverage it states it can provide that is close to the room or rooms you want to use it in. Don’t worry about getting it perfectly right. All brands take time to circulate and clean all the air in a room, so even if the listed coverage is a bit below what the product you buy is rated at, it will clean it eventually. Just remember it doesn’t need to be perfectly matched. Your goal is to buy a purifier with close to or greater than a coverage rating of the room you want to use it in. A purifier’s Clean Air Delivery Rate is a measured, numerical way to express how effectively a purifier can filter a room’s air. Introduced by the Association of Home Appliance Manufacturers (AHAM), the CADR rating is an industry standard for measuring the air flow of of filtered air. The main benefit of a manufacturer-provided CADR rating is that you know the purifier has been tested in a certified test lab by following industry guidelines. In other words, the CADR rating is a figure of measurement that is volume of filtered air delivered by an air cleaner. The higher the numbers (listed for smoke, dust, and pollen) the more effective it is at filtering. Generally speaking the higher the numbers or numbers, the better. 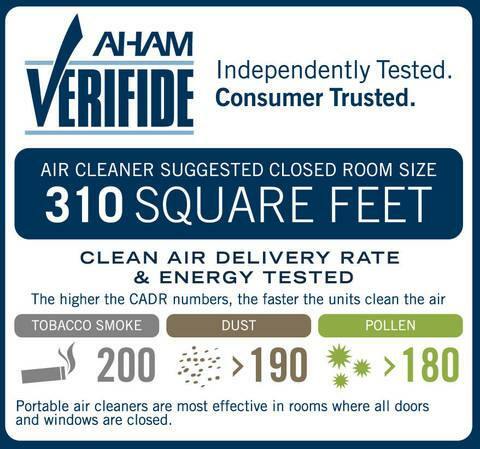 Products sold with a CADR rating benefit you because you know they have a proven amount of square footage air filtering coverage. There’s no guessing and it is a good indicator of a quality product with demonstrated filtering ability. Higher ratings for the tobacco smoke, dust, and pollen numbers are a sign that the unit will more quickly purify the air than a comparable unit with lower ratings. If the ratings between are the same between to products then the filtering performance is the same. “Whole house, portable, or wall-mount air purifiers, which one should I use?” You’ll likely be faced with this question as you set out to buy an air purifier. It’s actually pretty simple, but something you may encounter and should be aware of in advance. Portable ones can be moved around as needed while whole house systems cover the full interior of your home. Wall-mounted units are attached to walls and can be placed out of the way. What installation type should you buy? It basically comes down to personal preference. However, generally speaking, most people buy a moderately priced portable model. Many of those available today provide great coverage and air cleaning ability. You can also expect good reliability and fairly low maintenance costs. Since most people reading this will opt for a standard portable air purifier, I’ll cover the main things to be aware of when deciding where to place them after purchase. Generally speaking, bedrooms and the living room are the best locations to place them. Definitely place them in rooms which have the most traffic coming in from outdoors or which are periodically exposed to sources of external contaminants like outdoor pollution. If your pets mainly stay in one room most of the time but do move about (like to your bedroom) you might consider putting one in between rooms. If you find yourself having allergy symptoms in a particular room, that’s a tremendous clue that allergens are airborne there and you need a purifier in that area. Don’t place a purifier where air cannot circulate throughout the room well. For example, don’t place them in areas which are closed-off from air flow or obstruct the flow of air through them. Purifiers work by drawing in dirty air, filtering it, and blowing out the newly freshened air so it’s critical for best room cleaning to promote air flow. Locations off of the floor (like tables, end stands, dressers, and so on) are great as the device can affect air before the particles have a chance to settle further in the room. If you’re sensitive to light and sound when sleeping or concentrating like I am, definitely consider buying a model that has minimal noise production. Several quality products today have the benefit of allowing you to use them in your bedroom overnight without being disturbed. That’s the best way to get the maximum benefit. Otherwise, consider moving it slightly outside of your room. If you stay in a particular room for sleep or need to concentrate for work or studying, consider placing the device just around the edge of the open doorway or slightly out of the way. While many sold today have a special low-noise “sleep” mode or other low-speed setting with minimal noise produced while in use it can still be an issue for some of us. This includes me! I recommend therefore ideally buying a model you know won't produce distracting noise or simply move it into a slightly different area. Always read the owner’s manual before deciding where to use it! Don’t forget that reputable brands are well-tested and the manufacturer sometimes recommends the best locations for optimal air cleaning. In summary: Do I need an air purifier in every room? For the average person (like me) who likes getting an amazing buy for the money I recommend a product like this for your living room and one like this for each bedroom. I’ve noticed that the prices at Amazon are some of the lowest and the reviews are excellent, with plenty of buyer reviews to learn more from. As I mentioned earlier, don’t stress if you’re on a budget. I’ve written a helpful guide here with 5 of the top air purifiers under $100. Be sure to check out my other helpful guides like this one if you have pets or this post if you have a dust mite problem. Thanks & I’m glad you liked it.